Only at Stocky's - Meet the Bell & Carlson Rem 700 LA Light Varmint. Weighing about 2 lbs, this unit is ideal for lightweight, long-range, thick-barrel hunting builds. Similar to the uber-popular 700 Alaskans. 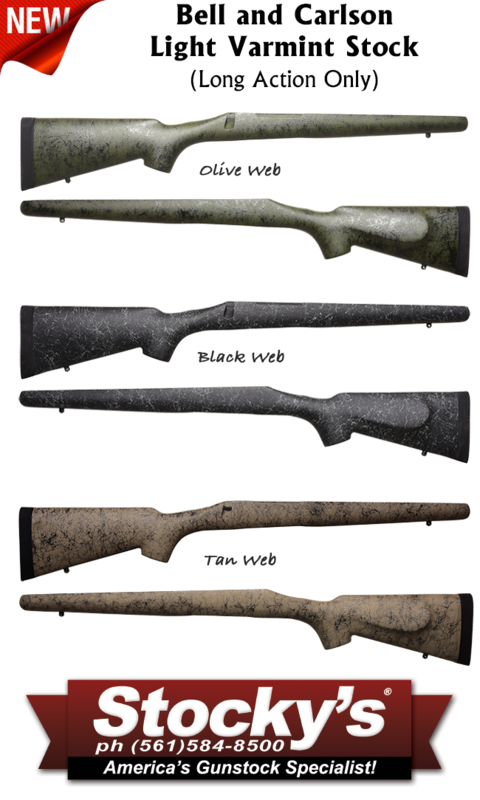 Perfect for Proof Research Carbon Fiber barrels, when so paired they will make up into an outstanding sheep rifle, weighing in right at at about 8 lbs scoped! The Bell & Carlson Ultralight Varmint stock was originally made by the masters at B&C for high-end OEM use and we have purchased all of the remaining overstocks. They come complete with Decelerator pad and studs. These units are a proprietary configuration with a bull barrel channel - 700 LA varmint / tactical / sendero barreled actions will drop right in and your barrel will float generously. They are also appropriate for use with Proof Research® Carbon Fiber Sendero and Sendero light barrels as well as other heavy barrel configurations up to the M24 and palma tapers, though minor fitting may be required in some cases. They are "Gen 3" Bell & Carlson stocks with the full length aluminum bedding block. Nominal Weight - 32 oz.